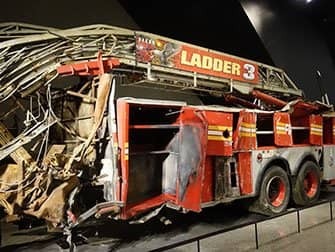 The 9/11 Museum in New York is dedicated to the events that took place on September 11th in 2001. The museum is situated on the 9/11 Memorial site. The museum itself is situated underground and has a very special yet sad atmosphere. 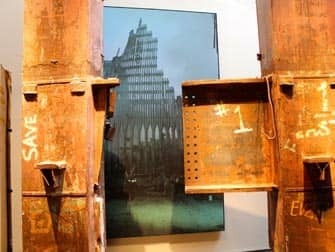 Visitors will see parts of the original pillars of the Twin Towers and other objects that bear significance to the events such as a scorched ambulance, destroyed telephone booths and helmets left behind by firefighters and rescuers. Almost 3,000 people who lost their lives in the attacks are honoured in the museum. The first thing the visitors will notice are the two 24-meter long pieces of steel, better known as “tridents”, that used to form the base of the original World Trade Center. The fires that lasted for more than 99 days after the attacks have turned the steel red and brown. When you continue from the “Memorial Hall” and make the descent to the basement (21 meters underground) you will pass “The Survivor Stairs”. This is a cement staircase that was used by hundreds of people who tried to escape the burning towers. The 9/11 Museum wants to showcase the influences the attacks had on individuals and the whole world. The emphasis is clearly on the triumph of human dignity over human corruption. Recognition is given to the thousands survivors and to all the people who showed support after September 11th 2001. 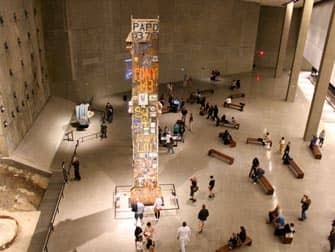 Two exhibitions are shown in the 9/11 Museum. 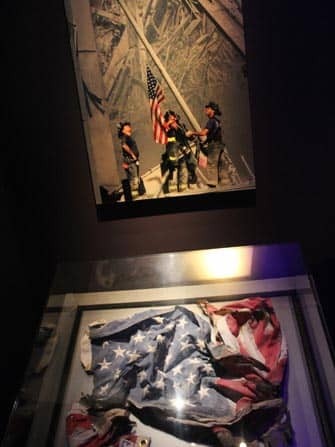 The exhibitions demonstrate the story of 9/11 through displays, archives, photos and actual objects. The “Historical Exhibition” explains the history of September 11th 2001. The exhibition is built in a chronological order: it starts with the beginning of the day and finishes with how the day ended. The “Memorial Exhibition” commemorates the victims. 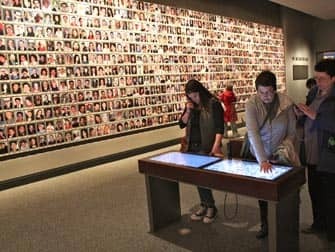 You can find a “Wall of Faces” where photos of all the victims are shown. Behind each individual photo you can find more information of that person. These archives were completed by their relatives. Location: Museum is situated on the 9/11 Memorial site. The closest metro lines are E (World Trade Center), R (Cortland Street) and J/A/C/2/3/4/5 (Fulton Street). Extra: You can visit the 9/11 Memorial site without visiting the museum. Visiting the 9/11 Memorial site is free. Extra: Entrance to the 9/11 Museum is included in the New York Sightseeing Flex Pass and New York Pass. Eric’s Tip: The museum is very moving and most people view everything in silence. The personal stories can be especially emotional. The staff is helpful and can give any explanations where needed. There’s also a free audio guide app you can download. When I was there, it was pretty busy but I could see everything without a problem. Seeing as I had already bought a ticket online, the queueing time outside was limited. 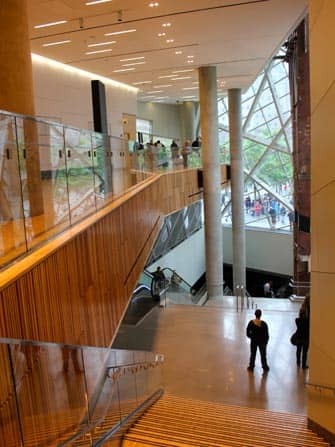 To view the entire museum, you’ll need 1.5-2 hours but if you choose to watch all the films your visit can take much longer. After the museum, you can also visit the 9/11 Memorial.